Samsung has come under fire from privacy campaigners after it emerged the company’s new smart TVs are capable of listening to your conversations. Viewers hoping to take advantage of the voice activation feature have been warned by Samsung not to disclose personal information because voice recordings can be captured and transmitted to unidentified third parties. Samsung insists it takes consumer privacy seriously, but did not name the third party which translates speech to text. The issue was first highlighted by the Daily Beast, which warned readers not to talk about incriminating matters such as “tax evasion” and “drug use” in front their TV sets. The technology is designed to enable viewers to control their TV by using only their voice. Even viewers who do not activate the voice recognition feature are still at risk of being snooped on, as the machine continues to collect data through its microphones. The only way to stop a Samsung smart TV from eavesdropping on your conversation is to disable voice recognition data collection in the settings menu. Samsung claims it collects transcribed voice data in order to improve the technology’s features. An investigation last year by consumer magazine Which? 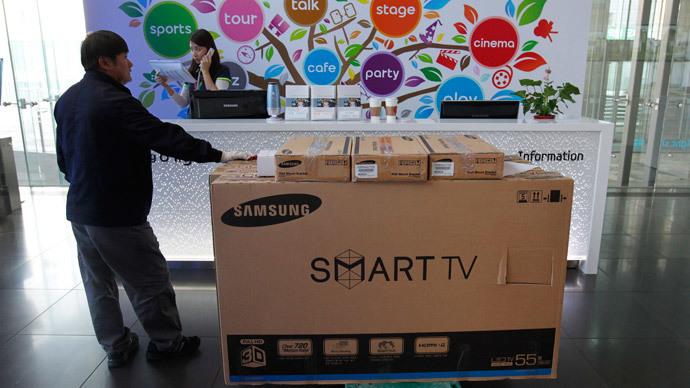 found that smart TVs made by LG, Samsung, Sony, Panasonic, and Toshiba track people’s viewing habits – something consumers agree to when they accept the TV’s terms and conditions. Users who choose not to accept their TV’s terms and conditions may end up reverting to a not-so-smart television. While Toshiba and LG block internet access and apps, Samsung reportedly stops customers from using the TV at all. Sony is the only manufacturer which blocks the tracking of television usage without restricting other functions. “If a consumer consents and uses the voice recognition feature, voice data is provided to a third party during a requested voice command search. At that time, the voice data is sent to a server, which searches for the requested content then returns the desired content to the TV,” the company said.